Diakont recently inspected an unpiggable section of a pipeline that had never been accessible for a major European natural gas pipeline operator. This inspection was crucial for the integrity management program because the natural gas pipeline was buried beneath a densely-populated urban area, making pipeline safety and reliability especially important. The high-consequence area (HCA) pipeline had not previously been inspected due to the limitations of traditional in-line inspection (ILI) methods. A major North American pipeline operator was having difficulty inspecting deep well booster pumps tasked with moving crude oil. The pumps are designed to be removed from the 18’ deep steel wells for repair and maintenance, but the wells themselves are installed in concrete casings. Inspecting the wells requires the operator to take them out of service for extended periods of time to remove and inspect. The pipeline operator approached Diakont to develop a robotic solution capable of inspecting the deep wells without removing them from the concrete. The robotic solution uses electromagnetic acoustic transducers (EMAT) and laser profilometry to provide comprehensive data for both the vertical well barrel and the horizontal flat cap at the bottom of the well. Using advanced robotic in-line inspection crawlers, Diakont has been successfully inspecting gas compressor station piping systems since 2004, and has assessed over 375 miles of unpiggable facility piping. Comprised of anywhere from 2000’ to 6000’ of pipe due to substantial mechanical and thermal stresses, compressor stations are difficult to inspect. Using proven, high-accuracy inspection methods, Diakont provides in-line pipe inspection services for these facilities to uncover potential hazards, including corrosion, lack of fusion on girth welds, and metal loss. Aaron Huber, Diakont, USA, outlines a robotic ILI operation on an unpiggable natural gas pipeline in an urban area. Diakont was commissioned to assess the integrity of a major North American natural gas pipeline, which was partially buried under an urban area. The company used a reduced size robotic crawler to successfully navigate a 10 in. pipe. The size of this pipe has previously been a limitation, making it ‘unpiggable’ using other inline inspection (ILI) methods. Diakont was commissioned to assess the integrity of three major North American large diameter natural gas pipelines that crossed beneath rivers. The pipelines had multiple bends and low-flow, making them ‘unpiggable’ using traditional in-line inspection (ILI) methods. They also required the use of a tethered device to guarantee a successful retrieval. Each pipeline inspection case had unique characteristics that required specialized robotic solutions. A team from Dominion Energy’s North Anna Power Station used Diakont’s robotic in-line inspection system (RODIS) crawlers to visually and volumetrically inspect auxiliary service water piping. These two lines provide an auxiliary feed from Lake Anna to the plant’s Service Water Reservoir. Portions of these lines were replaced in 1995, and the new 22” lines were sleeved through the two remaining 24” lines; therefore, excavation and visual inspection was not possible. Scheduling a storage tank outage to comply with regulations and industry standards can be inconvenient, especially when trying to align inspection schedules with repair schedules and customer expectations. 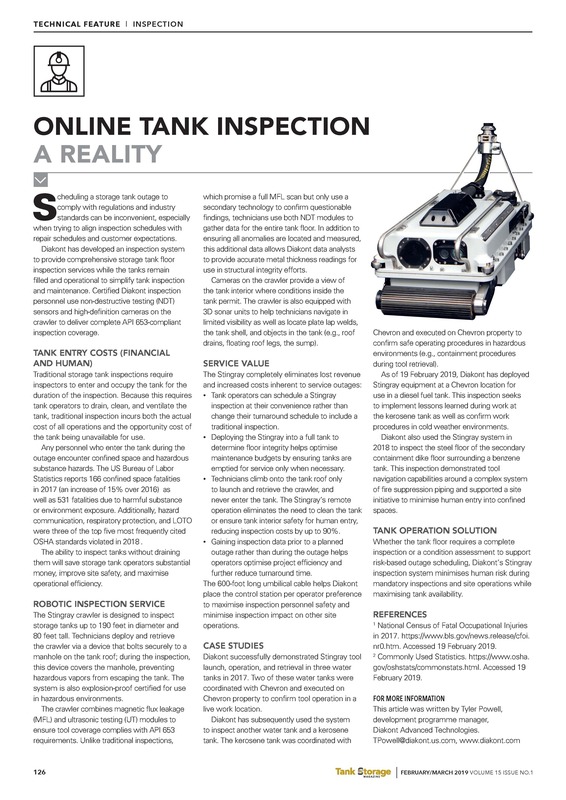 Diakont has developed an inspection system to provide comprehensive storage tank floor inspection services while the tanks remain filled and operational to simplify tank inspection and maintenance. Certified Diakont inspection personnel use non-destructive testing (NDT) sensors and high-definition cameras on the crawler to deliver complete API 653-compliant inspection coverage.